One similarity between Toronto and Miami is that both cities have experienced a condo boom. 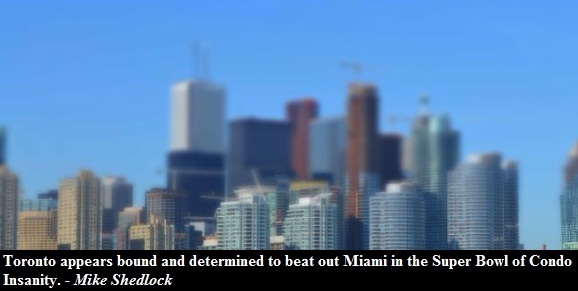 However, of the two cities, only Miami has experienced a condo bust in the past decade. At one point there were 37 high rise towers under construction in downtown Miami and 25,000 units under construction in Metro Miami. Currently in downtown Toronto there are approximately 70 towers being built and over 50,000 apartments units under construction in the GTA. Note that downtown Miami has half the population of downtown Toronto and that the GTA and Metro Miami have roughly the same population. Once it was estimated that as much as 70% of condo buyers in Miami were speculators. Similarly in Toronto the percentage of investors is estimated to be anywhere between 45% and 70%. As we all know Miami had experienced a condo bubble. Between 2000 and 2006 the median price in Miami had risen by $200,000 (175%) and then it crashed by roughly the same amount in a less than three years. Notice in the graph above how sales volume was falling while median price plateaued for over two years. Similarly in Toronto, condo prices have plateaued for the past two years while sales have been falling for just about a year now. But how about all those unsold new condo units in Miami? Well, they were auctioned off by a developer at a 50% discount. Check out the video below.